Halong Bay located in the north of Vietnam translates to descending dragon bay and is a very popular travel destination among families, honeymooners, and retirees. During my travel planning, I came across a tour company called Indochia Junk. 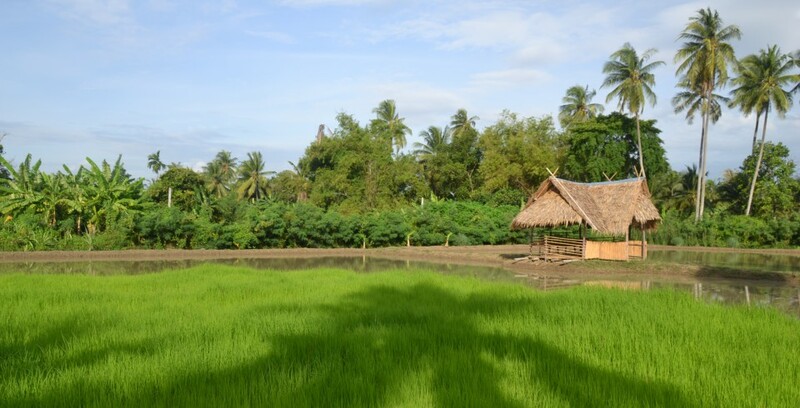 They offered a package that would take us from Hanoi, to Halong Bay, to Sapa and back again. We decided that was the trip for us! I mean really what could be easier than an already planned out trip with a toddler where someone is picking you up and taking you everywhere you need to go in a country where English isn’t heard very often outside of the tour guide speaking to you?! After a delayed flight in Bangkok with JetStar (I wasn’t thrilled with this airline and will not be using them again) we landed in Hanoi and made our way to our hotel in Hanoi’s French Quarter. We woke up early the next morning and Indochina Junk picked us up bright and early to start our adventure. We rode in a large van with another family for around three to four hours to the Indochina Junk office by the bay with a 30 minute break to stretch our legs about half way through the trip. Once we arrived to their office, each family/group was directed on where to sit depending on the boat they had assigned you to. We didn’t wait long, after about 30 minutes we met our tour guide who gave us a quick briefing and led us to the small boat that would take us to the Dragon Pearl 3 Junk Boat. 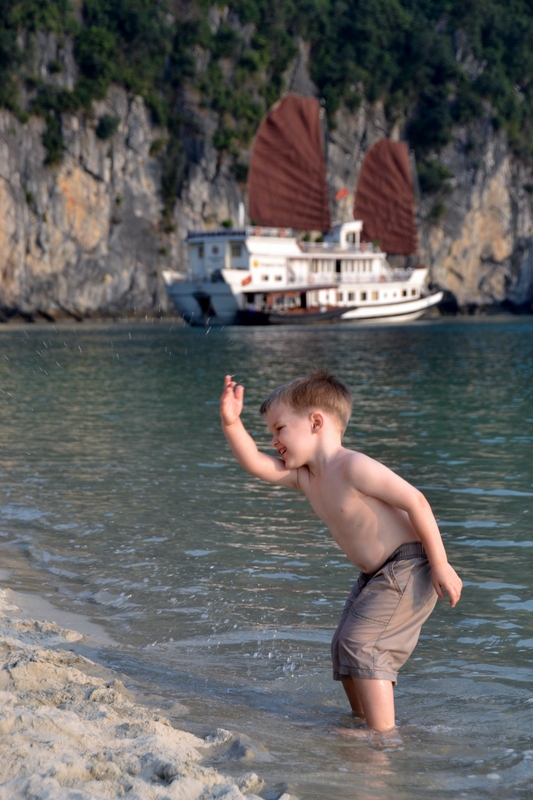 Indochina Junk offers many different types of boats perfect for any occasion or group but with our package and having a child in tow we were placed on their bigger cruise boat. The boat is modeled after the traditional Chinese junk boats that you would have seen long ago. There are eleven cabins, two dining areas, and beautiful sundecks to relax and sip a local beer or fancy cocktail. The cherry finish of the wood really popped alongside the white accents of the dining area, umbrellas, linens and trim of the boat. We arrived to the boat and were greeted with fresh juice and were debriefed again as to the plan for lunch, details for the day, and the assignment of rooms. Luckily for us, we were given the bigger room with the large bed so we could all fit. As you can see from the photos, the rooms are decorated very tastefully and modestly. The bed was comfortable and because we were in a bay the night’s sleep was enjoyable with no really tossing from the water. The bathroom was spacious and clean just like you would expect from any luxury hotel. I believe our favorite part was the outdoor dining area and the sundeck because of the picturesque views of the islands, the wind in our hair, and the fresh air with no city noise or pollution is just what we all needed to feel human again. From the pick up to the final email correspondence once we returned home to Bangkok, Indochina Junk has the best customer service I have experienced in Asia during our travels. I could not believe how accommodating they were with us and everyone on board for that matter. Anything we needed, the staff either on or off the boat were there to assist. Once on the boat, there are about six or seven men who are there to take care of your every need. To make it even better for families, they wanted to make sure our son was happy. We were the youngest couple and the only one with a child on our particular cruise but everyone there wanted to help (including the other passengers) make it a very enjoyable trip for our son. When it came to meal time, they would ask us first if our toddler needed a special menu and if he would like to eat earlier than everyone else because they heard him whining that he was “so hungry” but this was just a ploy for a jelly bean. Our first lunch set the tone for the scrumptious Vietnamese food that awaited us for the rest of our tour. Although I could not tell you the name of every dish served (there were far too many), the selection was massive with soups, fresh seafood, chicken, fresh vegetable salads, pork, spring rolls, and desserts. We ate like kings! The first day our son wasn’t too fond of all of the seafood so towards the end of the meal when he hadn’t eaten much we asked if the chef could just prepare a small plate of chicken and veggie stir-fry and they were happy to do so. Dinner followed that evening with another large selection of food, followed by another big breakfast in the morning, and right before we made it back to the dock to continue our trip to Sapa, we had another large a la carte lunch. No matter your food aversion or allergies, the chef and his staff are willing to help make your time on board enjoyable and want to ensure you have a full belly. 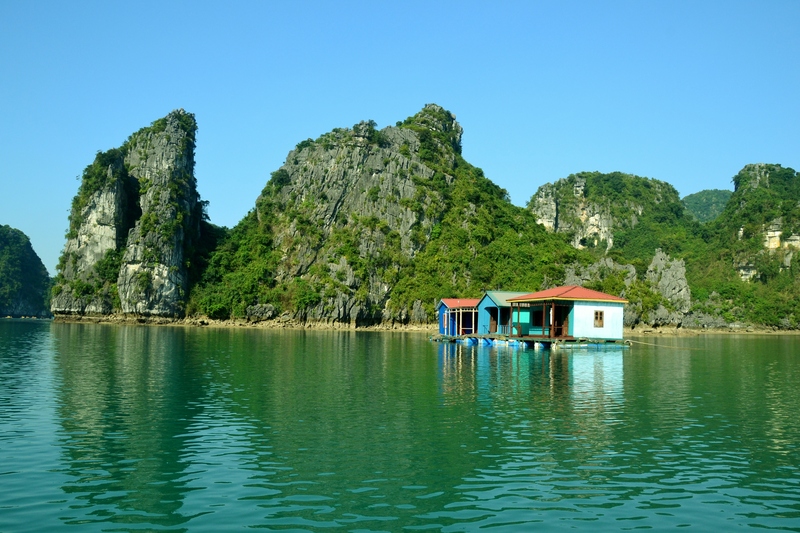 By the afternoon, we had made it to Bai Tu Long Bay and it was time to start the excursions. The guide led those interested to the small boat where he took us to nearby Hon Co Island. We made it to the shore and started a small trek up the mountain, due to all of the retirees on this trip this was not a difficult trek up and the toddler handled it like a champ. At the top, we had a great view for photos. Our guide led us down a little opening which was the beginning of the Thien Canh Son Cave. If you take other cruises with Indochina Junk, you could have a very romantic dinner planned inside the cave. After spelunking, we had about an hour to kayak around the island. They had small life jackets so our son sat on my lap in the front of the kayak while dad paddled us around the bay. We paddled the kayak up on the white sandy beach and spent another hour on the beach playing in the water and looking for little crabs. It was a lovely afternoon to enjoy nature and the quiet. The next day, we had another adventure awaiting us and we left the boat around 7:30am for the Vung Vieng Fishing Village. This fishing village isn’t as populated as it once was because a lot of the fishermen have moved onto other villages. Here we hopped on an old row boat and went for about an hour ride around the village where we met the local people and saw the floating school and fish farm. At the end of the trip, you float through a oyster farm and once off the boat you can see how the village harvests the pearls. I would recommend you bring your wallet because there is an opportunity to go shopping for some very pretty and relatively inexpensive pearl jewelry. Once we made it back to the Indochina Junk office, they had one more adventure planned for us that would also be our resting point on our three to four hour drive back to Hanoi. 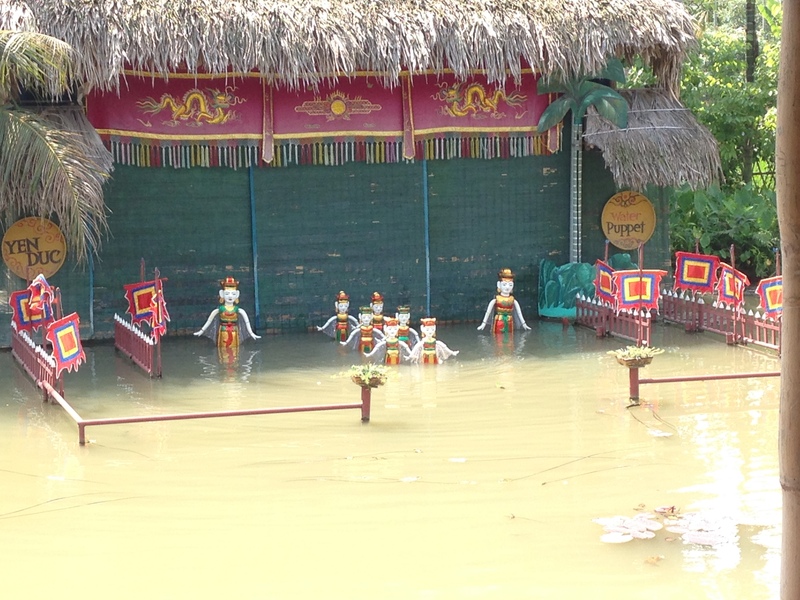 About an hour or so after leaving the office, we made a stop at the Yen Duc Village to see the water puppet show. We were greeted with smiling faces and more refreshments (at this point we couldn’t fit one more piece of food) and took a seat in their outdoor auditorium for the water puppet show. For nearly forty five minutes, we were taken on a journey by the host puppet Chu Teu through the different Vietnamese folk stories. 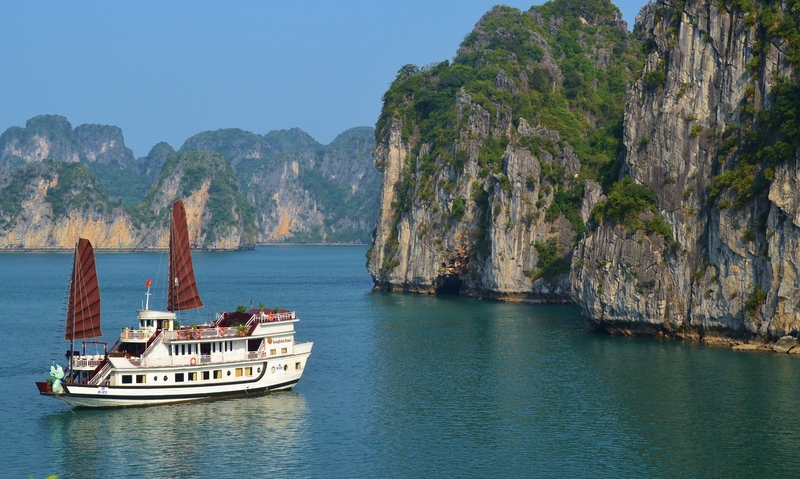 If you are planning your next vacation to Vietnam and plan on visiting the north, I would highly recommend Indochina Junk for your tour of Halong Bay. To make it even easier on yourself, look into booking one of their packages. You can look to my next post about Sapa to see how our trip continued and what you can expect from this package trip with Indochina Junk. Bottom line this was a very family friendly experience! We left feeling refreshed, well fed and happy with our latest adventure. To see more photos from this adventure click here.